Chennai, 16 October 1983. Mangala isai by nagaswara vidwan P.K. Madurai resonated in the foyer of the Kasturi Srinivasan mini hall of the Music Academy. A lovely floral display spelt the name of the magazine (see photo) which was soon to be launched that morning on Vijayadasami—an auspicious day. 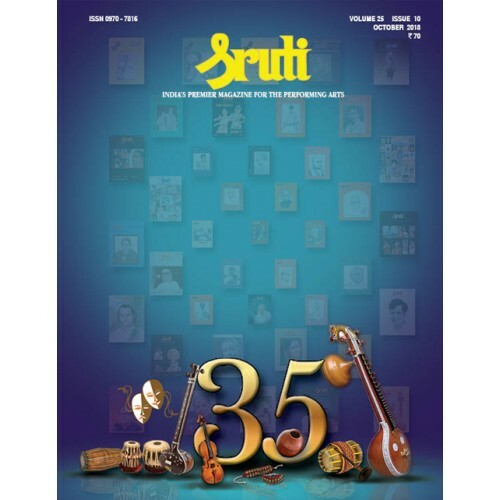 It was a double celebration to mark the release of the inaugural issue of SRUTI and the golden jubilee of Sangita Kalanidhi D.K. Pattammal’s concert career. The hall was packed, the audience overflowing in fact into the lobby, the foyer downstairs and even outside. It was attended and addressed by several notable figures from the world of music, dance and culture like Rukmini Devi Arundale, T.S. Parthasarathy, Semmangudi Srinivasa Iyer and T.T. Vasu. The launch of an English monthly solely devoted to Indian classical music and dance had raised eyebrows as well as expectations. At Sruti’s request, doyen Semmangudi presented “first copies” to some 20 men and women representing rasikas, musicians, dancers, scholars, teachers, students, the media and the trade. 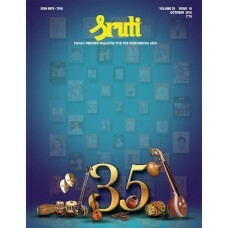 But before that he bought a copy for himself and requested everyone to buy a copy of Sruti as a gesture of support. The function sparkled brighter with little Mandolin Srinivas playing sampradaya music on his foreign instrument. Excellence, tradition and innovation were all highlighted throughout the function, signalling Sruti’s goals. What does it take to be slender, graceful and radiating positivity at eighty? Ask Guru Radha Sridhar and she may simply attribute it to an active lifestyle. But behind such simplicity is a hard-working woman who has built a virtual empire of Bharatanatyam in Bengaluru. As the director of Venkatesha Natya Mandira, which turns fifty this year, she has trained hundreds of dancers. Widely acknowledged for her choreography, she has been feted with numerous awards and titles for her commitment to the art form. Where did it all begin? Even as a child, Radha seems to have displayed a flair for nritta and abhinaya. She started with Kathak lessons, but soon switched to Bharatanatyam under the guidance of H.R. Keshava Murthy. Interestingly, when it was time to get married, she made her continued pursuit of dance a condition for marriage— a bold stand for a young woman in those days! Bangalore Nagaratnamma was familiar with the Royal House of Telaprole, a zamindari of Krishna district in Andhra. The estate holder’s family lived in Nuzvid. Their child and my mother Saraswathi Devi knew her from childhood. On visits, Nagaratnamma would listen to the child singing and playing the veena and offer helpful hints. This relationship continued after marriage. Nagaratnamma would be informed by letter when and where my mother would be in Madras, for the usual summer sojourn. Unfailingly she would turn up, in a hand-pulled rickshaw, all the way from George Town, and enquire about all members of my mother’s family. My mother was one of three daughters and three sons and Nagaratnamma knew all of them from their birth. Once it happened that my mother was in the family way when she called. Asked about her well-being, she replied ‘Okay’, rather briefly. In our royal families, the man can take another wife if the present one gives him three daughters consecutively. To continue the patriarchal line perhaps. As my mother’s first two were daughters, Nagaratnamma presumed that she was worried about the possibility of the present pregnancy also yielding a daughter, and its consequences. Listening to French radio one night in 1977, I noticed a recording by Ramnad Krishnan being discussed at great length. This happened to follow a daily poetry session I loved listening to, so Carnatic music was not what I had tuned in for. Yet, to me, being a student of Western music, keen on learning more about all kinds of music, this music was a revelation. To my ears, this music was more than just one among others, each worth appreciating in its own right. I realised that this experience answered some questions I had long been pondering: Could there be any music that is, at the same time, “ancient” and “flourishing” in the sense of unbroken continuity with scope for self-expression? And if such a music could be found, would it make someone like me feel welcome? Without having grown up in its cultural context? Little did I know that the second question had long been answered in the US where Carnatic music was in the process of becoming one of the best-studied music traditions, thanks to Wesleyan University’s “visiting artists” programme that had invited Ramnad Krishnan to the U.S.A.